In the shadowlands where transfer news and transfer gossip merge into clickbait balls was the summer’s news that Manchester United were dead keen on Tottenham’s Toby Alderweireld. Today the BBC tells its readers that Man United “made no attempt” to sign Alderweireld, 29, from Spurs. 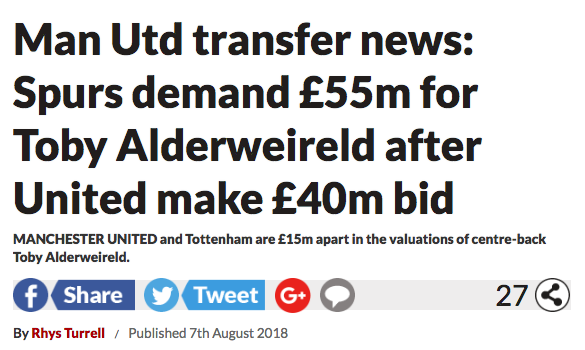 Tottenham were demanding £75million for Alderweireld, but a compromise has been reached and United are poised to complete the deal. Manchester United made NO attempt to sign Toby Alderweireld or Danny Rose in the summer transfer window… despite reports claiming otherwise. In fact, it’s emerged that it was Spurs who informally approached United, their hosts for Monday night’s Premier League game, to ask if there was interest in either of their stars in the lead up to deadline day. Fact. But on August 5 the Mirror said United were “set to sign” the Belgian for – get this – £60m.